How much does a destination wedding at Park Hyatt, Goa cost? Planning to host a grand beach wedding in Goa? With a radiant sun as the backdrop and shimmering sand as the dancefloor? Don’t worry, we’ve sorted out for you the best venue in Goa to host your dream destination wedding. Located in Bambolin is the magnum opus of Indo-Portuguese architecture – The Grand Hyatt, Goa. Exuding a vibe of romance and magnificence, this luxury resort is spread over 28 acres of lush tropical gardens. Overlooking the dazzling waters of the Bambolin Bay, The Grand Hyatt Goa pampers the guests with an abundance of hospitality and warmth. 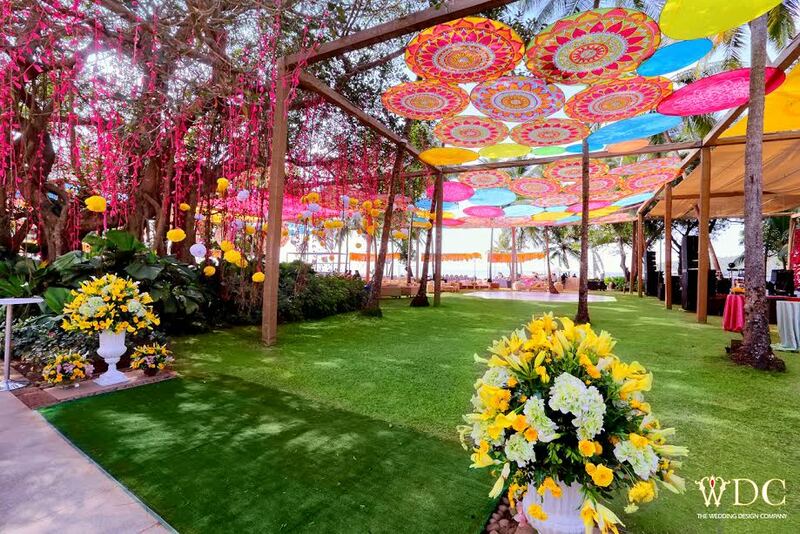 The 17th century palatial wonder is perfect to host your much-awaited beach wedding in Goa, thanks to its splendid indoor and outdoor party venues and versatile function rooms. Situated in Bambolin, Park Hyatt, Goa is just 7 km from the capital city of Goa, Panaji. 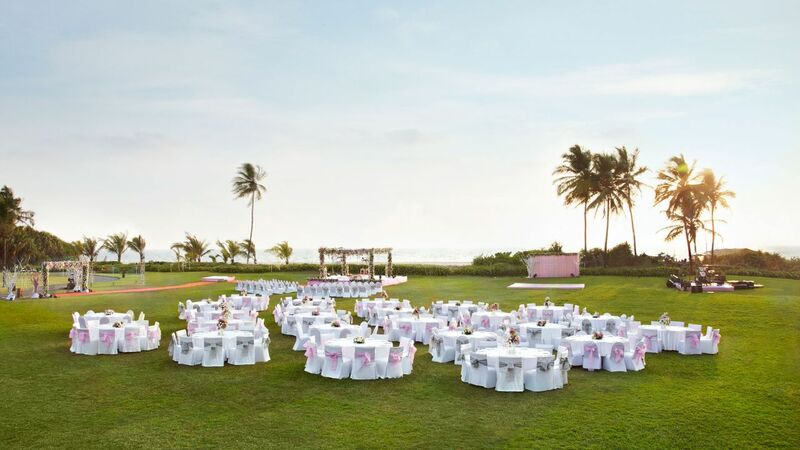 With its welcoming sea breezes and visually stunning view of the Bambolin Bay, Park Hyatt, Goa is literally a heaven down on earth to host your beach wedding in Goa. Accommodation: The venue consists of a total of 312 well maintained deluxe room with 14,000 – 18,000 INR per night. Food: The venue does not allow outside catering service. Apart from this, there are various other extravaganzas which may add on to your wedding budget. Mandap: Express to your event organisers in Goa, if you would like an outdoor mandap by the beach or a fancy indoor mandap setting. Tables & Chairs: You can arrange for a comfortable seating for your guests in the spacious function venues of the resort. Center pieces: Add a dash of culture to your big day by positioning Goan art inspired center pieces. Dance Floor- Let your guests live in the moment of celebration by arranging for a dance floor. LEDs & Lightning: Correct lightning plays a crucial role in elevating the aura of your event! Stage: Depending upon the occasion, whether a lively sangeet or a grand reception, choose your stage setting wisely. Flower Décor: Ameliorate the décor game by adding the correct dash of pinks and oranges by ornating the venue with orchids and roses. Photography – choose the best photographer as per your needs who is skilled enough to capture your best frames. Transportation and Logistics – Prepare a fixed numbered team for transportation and logistics so that you don't run out of required items for your big day! Sound and DJ setup : Inform your music provider with correct venue and your taste in music. Makeup and mehndi artists: Pre book your Mehndi and makeup artists to avoid last minute jitters. Folk artists : Add some extra tadka in the occasion by arranging delightful performances by the local artists. How Much Does A Destination Wedding At The Zuri White Sands Resort & Casino, Goa Cost? How much does a destination wedding at Samode Palace cost? Thanks! Your details have been submitted. © 2018-19. Weddings by Neeraj Kamra. All Rights Reserved.